Back in 2003, I proposed that genomes were designed to be modular and mutable and that this was the probable explanation for the rapid species diversification immediately after the Flood. I also suggested that these genomic changes were the direct result of environmental stress. Barbara McClintock thought something similar about speciation and genomes. She called the genome a "highly sensitive organ" that can respond to new conditions by rearranging itself. In 2003, I had a few examples of eukaryotic retrotransposons that mobilized during periods of stress, but I knew of no examples of any rearrangements that could be linked to a useful phenotype. I guess I've been on a biography kick lately. 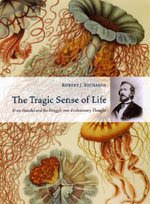 I didn't even notice it until I sat down to write this, and I realized that recent posts have focused on Haeckel (Richards's new bio) and Darwin (the latest issue of Answers mag). Now I'm going to write about Darwin again, but I'll try to make my comments short and worth your time. Well... at least worth your time. I picked up both of Janet Browne's biographies of Darwin, Charles Darwin: Voyaging (1995) and Charles Darwin: The Power of Place (2002), when I visited Down House on a miserably cold and rainy day last March. Some years ago, I read Desmond and Moore's Darwin: The Life of a Tormented Evolutionist, which I really enjoyed. Browne's two massive tomes were a nice expansion of the story I already knew. John Wilkins (1614-1672) is not the most famous name of the Enlightenment, but he made important contributions to the history of science and religion. He was a latitudinarian English clergyman during the tumult of the mid-seventeenth century England. He was also the first author to write an English language defense of Galileo in 1638 and 1640, in which he championed Galileo's doctrine of accommodation. He later helped found the Royal Society, of which he served as one of the first secretaries. Whenever I'm working on a project, my desk spontaneously grows piles of stuff, mostly books I'm reading, articles I should read, and journals I don't have time to read. When each project is finished, it's time to clean off the desk and get ready for the next one. Last Friday, I finished up four big projects (which you'll hear about later), and what followed was a serious desk cleaning. Cleaning the desk is always interesting, because you never know what you might find. It's like a little archaeological expedition. Who knows? The Ark of the Covenant could very well be lost somewhere on my desk. I also want to take this opportunity to rave about the Grants' new book, How and Why Species Multiply. If you want to understand natural selection using some of the best research on the topic, don't just sit there reading my blog. Get their book. I'll be back tomorrow with a post on human genome variability. So... It's cold in Michigan: Christmas the way it was meant to be experienced. What's better than waking up to nine degrees? So far, that's been the high for the day! This afternoon, there's going to be a windchill warning. This is the coldest Christmas in quite some time. The funny thing is that it was 68 on Friday in Dayton. Can't have Christmas like that. Submit to every human institution because of the Lord, whether to the Emporer as the supreme authority, or to the governors as those sent out by him to punish those who do evil and to praise those who do good. For it is God's will that you, by doing good, silence the ignorance of foolish people. As God's slaves, live as free people, but don't use your freedom as a way to conceal evil. Honor everyone. Love the brotherhood. Fear God. Honor the Emperor. I think this might be completely wacko, but I'll post it anyway. Read at your own risk. As I pondered starting this blog, I needed to make sure that I actually had enough to post about. I'm not really a talkative guy. One idea I had was highlighting items from the CORE library. Our original library was accumulated over a lifetime of collecting by Kurt Wise. Tragically, nearly all of that library was lost in a fire that destroyed the Bryan College administration building in February of 2000. Since then, we've been rebuilding the collection a little at a time, with occasional help from foundations and donors. Since becoming CORE director, I've tried to make library development a priority, and we've added significant items to our collection. This seems like a perfect forum to share some of them. In case you missed it, the call for abstracts for the 2009 joint BSG/geology meeting has been posted at the BSG website. This year's conference will be held at the end of July at Southern Baptist Theological Seminary in Louisville, Kentucky. The abstract deadline is April 4, 2009. Our plans are still tentative, but we intend to devote a whole day each to geology, biology, and the papers from Genesis Kinds: Creationism and the Origin of Species. Registration for the summer conference in Kentucky will be available after the England conference. There's also still room available at the February Genesis Kinds conference in England. You can register online or by post. Coming up from Answers magazine in January, 2009 is their theme issue on Charles Darwin. You're probably thinking that you've read everything you could possibly read on Darwin from a creationist perspective. I sympathize with that. Creationists tend to be a broken record when it comes to hammering home the creationist message about Darwin. I think you'll find this issue a little different. I contributed a very little reviewing and writing for this issue, and I've seen some of the articles. I guarantee, they're not what you would expect. A few of the articles have already been posted at the Answers website as a sneak preview, and you can judge for yourself. "Haeckel: Legacy of Fraud to Popularise Evolution"
"Influential Darwinists Supported the Nazi Holocaust"
"Ernst Haeckel: Evangelist for evolution and apostle of deceit"
"Haeckel: the legacy of a lie"
In case you didn't know, this year is the twentieth anniversary of the Center for Origins Research. Yeah, I know there's another anniversary this year, but that one's not nearly so important. We created an anniversary website where you can find out more about CORE and some of the events we have planned for our anniversary. You know those creationist books that try to explain variation in human skin color by appealing to mendelian genetics? They give the impression that God created Adam and Eve with all the alleles for human skin color, and by mendelian sorting we get the modern races. You know what books I'm talking about. Just about every major creationist organization has used human skin tone to illustrate mendelian genetics in one publication or another. A recent review article by Jean Lightner addresses this idea directly, and I thought I would highlight it here, since its impenetrable title ("Genetics of Coat Color I: The Melanocortin 1 Receptor (MC1R)") is likely to put off those who might most benefit from reading it. Here we go: my first newsy post! CORE just recently released the third volume in the CORE Issues in Creation monograph series, titled "Animal and Plant Baramins," written by yours truly. It's a new study of more than three dozen new baramins, colloquially known as "created kinds." Why is this interesting? It significantly expands the number of identified holobaramins. It's the first large-scale application of statistical baraminology. And the overall results are starting (just starting) to look very interesting. Read the abstract or get it from the publisher Wipf and Stock for $23.20. P.S. We've got two more volumes of CORE Issues almost ready to go to the publisher, and another one in production. Busy, busy, busy! I must be crazy. Just the other day, I was telling someone how much I value my anonymity, and here I am starting a blog. Frankly, I never thought much of blogging. After all, it's totally free, anyone can do it, and there's no control whatsoever. It just seemed like a big waste of time.